You always have to find new ways to keep up with what your customers are doing. Their behaviors, their culture. How they behave in the digital world and understanding those traits can be extremely beneficial for your ventures. So you should use tools that value what really matters and uses that knowledge to build up their own feature. Features that are truly going to be beneficial for all parties. Today we will talk about one such solution for WordPress. 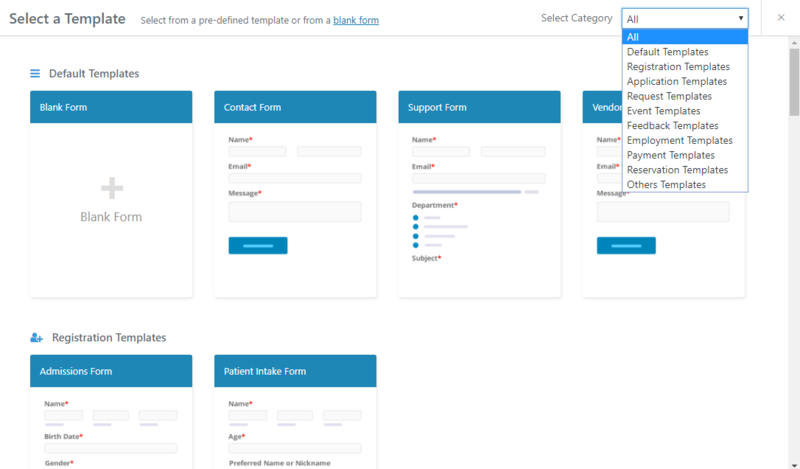 A form builder plugin. 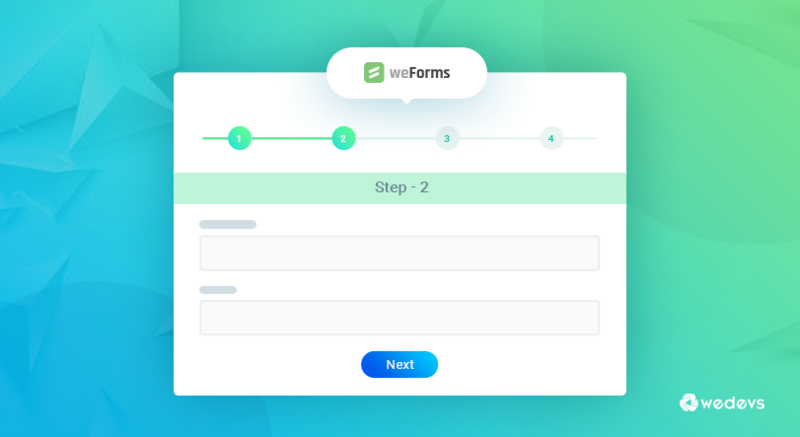 weForms is a WordPress form builder plugin, that is without a doubt the fastest one on the market. Due to its simple page operation nature, it is extremely efficient. At the same, it is packed with the features that are essential for any form building task. Including conditional logic, Form Payment integration, multistep form building. Today we will talk about the easy multistep form building configuration that weForms offers. If you want to see the full feature list you are always welcomed to visit the official website. Why Do You Need A Multistep Form Anyway? Time is becoming more and more important for your users every day. Instead of fighting the short attention span of your customers, the smart move would be to adapt to it. Making it so that they feel that their most valuable asset is not being wasted by you. A multi-step form is a right step towards that goal. No those are not our findings but from a respected source. The people over at VentureHarbour pointed out these traits in their recently published article regarding why multistep converts more. You can learn more from here. P.S. Conversion rates sometime went as high as 300% when converted from a regular form to multi-step form. weForms was built to be the most featureful form builder for WordPress at the same time to be extremely user-friendly. In that term, weForms has built-in settings to make everything easy. Just like it's built-in WordPress multi step form builder settings. To get started, at first, you need to create a form. Go to wp-admin→weForms→All Forms. Note: You need to have any of the paid version of weForms. There are more than 20+ pre-built templates to choose from. For reference, we chose the Job Application form template. You will find it when you scroll down the list. After creating a form you will be redirected to form building page. There in the top section, you will find the form settings tab. In the settings tab, you will find a checkbox to enable the multi-step feature for that specific form. Tick mark it to start to process of creating your multi-step form. 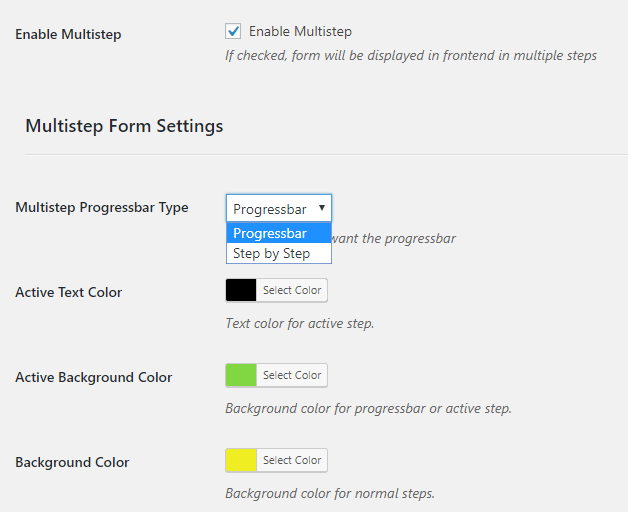 Multistep Progressbar Type: You can choose from Progressbar format or a Step by Step format bar at the top of your form. Active Text Color: This lets you choose the text color of the stage where your users will be active. The active step from the multiple steps. Active Background Color: Choose from a wide range of color for the background of the active step bar. Background Color: Option to choose the background color of the inactive steps. Now from the form builder interface, you need to add the Step Start field to where you want your forms to break. Simply drag & drop the field to your desired location and place it. In the settings menu, you can configure the name of the step, set conditions. Now save your form. Publish it to the front end of your WordPress site using the shortcode. 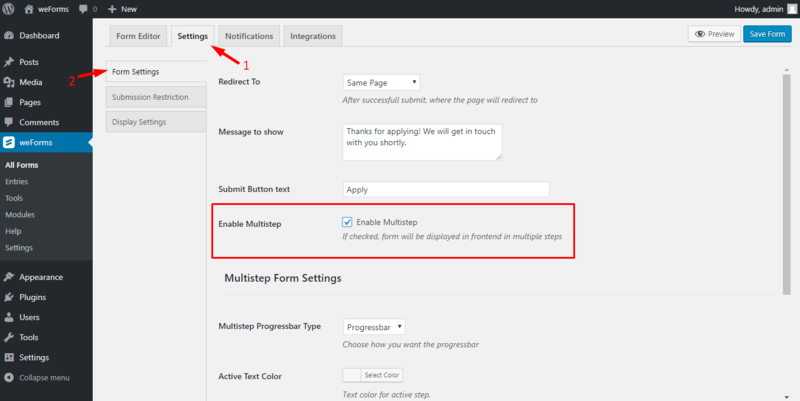 You can see our official documentation regarding how to create a multi-step form. Once you published your WordPress multi-step form, it should look something similar to this. Want To Try Out Now! It is extremely easy to create WordPress multi step form in weForms. Just set up a few configuration settings and you are good to go. If you would like to test weForms and all the other great features it provides you can always check out the official demo.